History Department lecturer Robert Hutton has just published Bloody Breathitt: Politics and Violence in the Appalachian South (University of Kentucky Press). His research offers a new interpretation of the Appalachian region’s reputation for “feuding.” As Hutton explains, “From the Civil War until the Progressive Era, Breathitt County, Kentucky earned a peculiar reputation for killing. Politicians, journalists and writers of fiction wavered between portraying the county as either a unique pit of degeneracy, or an exemplar of natural tendencies innate to the “mountain white.” Challenging a view held by many Appalachian historians, Hutton does not suggest that “Bloody Breathitt” was an exaggeration; indeed, his book makes clear that it was a violent place in an especially violent stretch of American history. But Hutton shows that much of the county’s violence was the outcome of intense power struggles, and reflected broader trends in the history of Kentucky, the South, the United States and beyond. 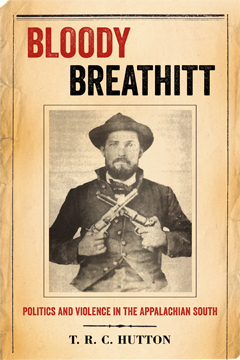 Above all, Bloody Breathitt offers fresh insight into the violence of the South and America, as well as the language we use to blame, dismiss or justify after the fact. At UT, Robert Hutton teaches courses in Appalachian history, Southern history, and 19th and 20th century US political history.